Dr. Joe Montgomery is a board-certified ob-gyn specialist who has practiced in the Cy-Fair area for more than 20 years. He is a native Texan, and has lived in the Houston area since childhood. After graduating from the University of Texas, he attended Baylor College of Medicine in Houston, receiving his M.D. degree, with honors, in 1977. He completed specialty training in ob-gyn, also at Baylor in Houston in 1981. He has practiced at Cy-Fair Hospital since it’s opening in 1983. He was the first gynecologist on staff at the new North Cypress Medical Center, where he has now relocated his practice. His wife, Denise Montgomery, R.N., serves in the practice as registered nurse and office manager. They have 2 children and 4 grandchildren. Dr. Montgomery has served as chairman of the ob-gyn department and Chief-of Staff at Cy-Fair Hospital. Denise Montgomery, R.N. has been recognized in “Who’s Who in American Women” for research in the field of ob-gyn. 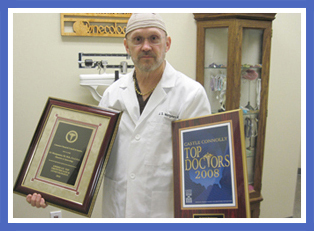 Dr. Mongomery has earned several prestigious awards including Consumer's Research Council of America's Top Obstetricians & Gynecologist of 2010 and Top Doctors 2008 from Castle Connolly.